With Connor and Isla, it was total happenstance that I took literally identical pictures of them mere days apart in age. This time, I saw it coming. I actually remembered the week before and checked so I could take the pictures of Callum at the right time. They were taken at the exact same age as Connor. At 8 months old, all three kids were within half a pound of each other. Callum was a little longer than the other two. 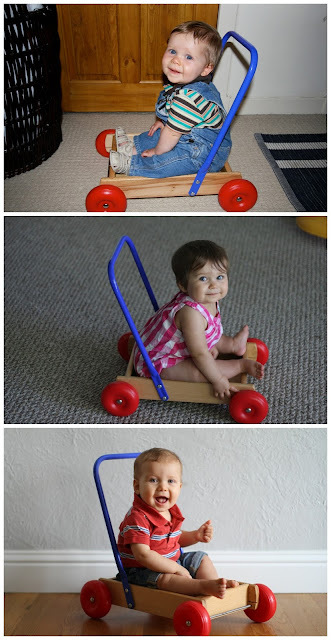 I would say they all look relatively the same size in the photos, though Connor does look a little shorter, given his legs aren't sticking over the end of the wagon. Also, look how much hair Connor and Isla had compared to Callum! At this age for Connor, he could already stand up and walk holding on to things. Isla was a little bit behind. She could go from laying to sitting by herself, but wasn't quite standing up on her own. Then there's happy little Callum. He is content just sitting…and that's sitting where I set him down. He can't yet go from laying to sitting. And he really has no interest in standing. All in his own time. What he lacks in physical ability, he makes up for in his smiles…smiles for days, I tell you. An interesting little back story about this little push toy. It was actually one of Ian's coworkers in Scotland. Both her boys played with it, then she handed it down to us. It's fun to me to watch toys get played with over and over again by different kids. Another little "fun" fact, all three kids lived in different houses at 8.5 months old. That's kind of crazy when you think about it. But, we were living in Aberdeen, Scotland with Connor, our old house in Modesto with Isla and now our new house with Callum. If there is ever a fourth child, I kind of hope it doesn't include another move! Just in case you want to look back, three kids, one outfit and same hat, different boy.